The American Staffordshire terrier (or Amstaff) has an interesting history that relates closely to the bulldog – in fact, the Amstaff more closely resembles the original bulldog than does today’s version of that breed. In the 1800s the bulldog was taller and more athletic than today’s squat, smash-faced companion breed. It was used for bear and bull-baiting, where the dog would fight those animals prior to their being slaughtered for market. As the sport of baiting fell out of favor in the 1880s, the bulldog nearly went extinct. Aficionados of the breed revived it, breeding for the extremes of character and appearance in the breed that we see today. The Amstaff split from the bulldog before the fall of the baiting practice and the selective breeding process for extremes was undertaken. At some point, probably in the early to mid-1800s, the bulldog was crossed with a terrier of some sort, which added even more tenacity to the willful bulldog. The Amstaff began to appear in the United States as early as the 1870s, and was used in both America and England, where it originated, to fight in pits with rats, as well as other dogs. In England the bulldog/terrier cross was known as bull-and-terrier dogs, pit bulls or half and half dogs. According to Wikipedia, the name Staffordshire bull terrier was eventually used in England as the breed standard became defined. In America, they became known pit dogs, then the American bull terrier and later as the Yankee Terrier. In 1936, the AKC accepted today’s Amstaff for registration and made the name official. The addition of “American” to the name reflects the difference in breeding practices from the English counterpart; American Staffordshire terriers are both taller and heavier in build. Related to American pit bull terriers, Amstaffs possess more bulldog-like features in the head and face than pit bulls. Like the American pit bull and Staffordshire bull terrier, Amstaffs might show above-average aggression toward other dogs but should never be aggressive toward people. Proper socialization with other dogs and situations when young can help alleviate any aggressiveness. While all three breeds are subject to bans in many countries and owners face increased scrutiny when renting apartments or houses, as well as at some events, the fierce reputation and propensity to bite have more to do with owners not socializing and training their dogs well, nor recognizing cues and situations that signal issues for the dogs. Amstaffs (and related breeds), need a intelligent owner that will consistently engage and train the dog. Athletic, strong and smart, Amstaffs excel in weight-pulling contests, agility trials and obedience, among other contests. They’re good companion animals and are part of the AKC’s terrier group. 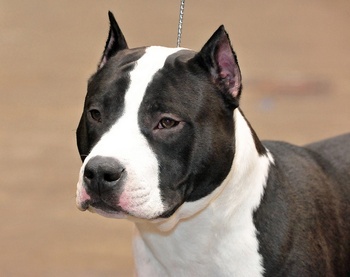 According to the AKC, the Amstaff should possess a short, close, glossy and stiff-to-the-touch coat. Any color in solid, partial or patched is acceptable, with the exception of a dog possessing more than 80-percent white, black-and-tan or liver coats. While the hair is short and smooth, the dogs still shed regularly. Relatively healthy dogs, Amstaffs live an average of 12 to 16 years. Most of the health-related issues have to do with structural development: hip and elbow dysplasia, congenital heart disease, luxating patella, as well as some thyroid issues. Paw Print Genetics offers an American Staffordshire terrier panel that includes screening for three genetic mutations, including: alopecia, hyperuricosuria and neuronal ceroid lipofuscinosis 4A.